Lassies are soothing lullabies of my home, India. Mango lassi is a manthram like magic melody and I love it. 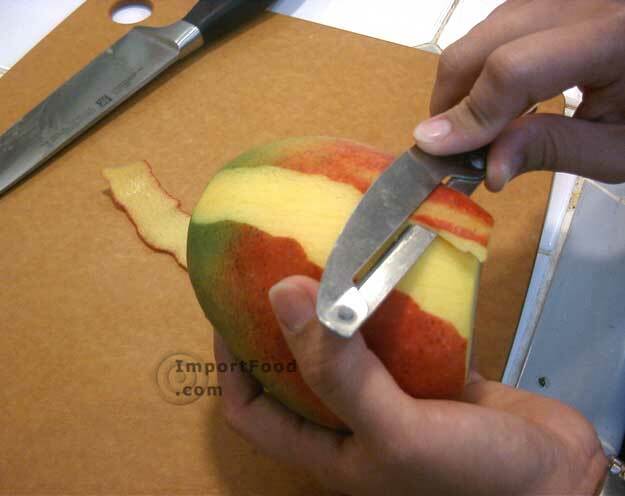 Peel and cut mango to small pieces. Take them in a blender. Add maple syrup and cardamom. Puree to smooth. Add yogurt and about half glass of water. Blend until well mixed. Refrigerate for about 15 minutes. Pour into two glasses. Enjoy the soothing mango lassi lullaby. During the years we lived here I ate many salads but none was better than the ones prepared at home with fresh ingredients. The homemade have crisp texture and full flavor, thanks to the no wait between kitchen and dining table. The following is a new one I have prepared for our meal today. Roasted chestnuts, watermelon, lettuce and yogurt -pepper dressing. The taste was so special and it has made me think about a suitable title. As far as I know, Andhra meal doesn’t have a salad component. But Karnataka and Maharashtra meals have. Kosambari or Koshimbir, they call them. Usually eaten as a light snack or as a part of full course meal, Kosambari is prepared with fresh vegetables, lentils, legumes or nuts with coconut, lemon or yogurt dressing. My meal fits the profile. Why title salad for everything, when we have such beautiful sounding name “Kosambari”? My yogi diet with fresh ingredients will be Kosambari from now on. Roughly chop chestnuts, lettuce and watermelon to bite-sized pieces. Take them in a bowl and combine. Whisk yogurt with pepper and salt. Pour over the chopped ingredients. Enjoy the chestnut kosambari as a light mid-day meal. Due to my craving for something I have never tasted before, the chestnuts have leaped from roasting skillet into the steaming pot on New Yearâ€™s Day at my home. The chestnuts that appear during winter season here have been a fascination for me for the last couple of years. I like roasted chestnuts. This year I ventured into boiling and cooking with chestnut territory. The boiling process is similar to how we do with fresh crop peanuts in India. But with chestnuts we have to score and then steam. Once the shell softens, drain the water. Peel the outer covering and enjoy the tender chestnut inside. Boiled chestnuts taste almost like boiled peanuts (and jackfruit seeds san the smell). Sweet, nutty and starchy, with aroma typical of boiled nuts. For our New Yearâ€™s Day meal, I prepared a chestnut and date yogurt. Finely chopped few dates and boiled chestnuts and then added them to yogurt. A sprinkle of salt. There it is, a fine and exotic side dish welcoming the 08. Diminished appetite and constant need for something cool, it’s that kind of hot day here in Seattle. To revive the sweltering spirits, I had to prepare something pleasant. Sweet and juicy, in rich mahogany color, Washington stateâ€™s own beautiful bing cherries came to the rescue. Few cherries halved, pitted and mixed with yogurt, then refrigerated for half an hour. Preparing chilled cherry yogurt at home is a simple process with delightful results. Rinse and cut the cherries in half. Twist, separate the halves and pullout the pit. Add salt and sugar to yogurt. Whisk the yogurt to smooth or buzz in a blender. Stir in the cherries. Refrigerate for about half an hour. Enjoy the chilled cherry treat! This north Indian style curry is not a regular preparation at my home but a guest. Though curry is quite easy to prepare and tastes soothingly smooth, I rarely make it mainly because this is not the dish that I grew up on. Okra-coconut curry and okra sambhar are what I am used to. Once in a while, like a visit from a cultural-exchange student, I do enjoy treating okra and myself in this special way. 1 cup of plain yogurt (I used traditional Indian home-made yogurt for this recipe). Take it in a cup and churn it for smooth consistency without any lumps. Heat a teaspoon of peanut oil. Add and toast 4 to 6 curry leaves, pinch of each - cumin and mustard seeds in that order. When seeds start to dance around, add the okra rings. On medium heat, cook the okra for the about 5 to 10 minutes covered until they soften little bit. Stir once or twice, more like shake the skillet and toss the okra. Leave the okra alone for spectacular crunchy results. Stir in turmeric, salt and red chilli powder to taste or ½ teaspoon each. Mix and cook for another 5 to 10 minutes on low heat. Serve hot with rice or with roti. My personal preference is having it just plain in a cup with some more yogurt added. Saffron soaked in 2 tbsp warm milk - a pinch. 1. Drain the water from the yogurt by tying it in a soft muslin cloth and hang it over the sink for at least 2 hrs. 2. Once all the water is drained from the yogurt, it automatically gets a creamy texture. 3. Mix the yogurt and sour cream thoroughly in a serving dish. 4. Mix in the mango pulp and sugar. 5. Check the sweetness and the flavor; add more sugar or mango pulp if needed. 6. Ensure that the texture of the dish remains creamy and not watery. 7. Mix in the chopped nuts, cardamom powder, and soaked saffron along with the 2 tbsp milk. 8. After mixing thoroughly, chill in the refrigerator for at least 3 hours before serving. Thanks Manasa for taking part in JFI-Mango event and for this fabulous mango dessert recipe.